The M 95 respirator represents the standard in modern CBRN protection providing unrivalled reliability, safety and user-friendliness. Designed to meet the most critical hazards and stresses encountered in combat situations, the M 95 CBRN mask is user preferred. The M 95 is in active service throughout the world, by over 60 different agencies in more than 20 countries. M 95 is trusted by both military and first responder teams, law enforcement personnel, national guards, naval forces and marines. 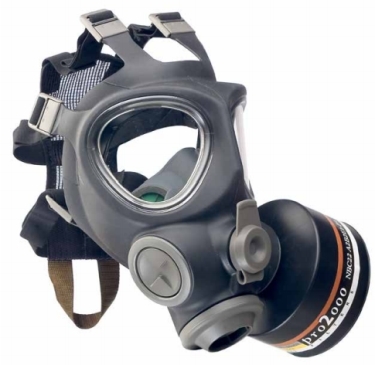 Manufactured to the highest tolerances within our respiratory production facility based in the UK, M 95 remains part of the core respirators of the defence range. Precise fit and user comfort are the result of advanced computer aided design. Anatomical accuracy is based on a wealth of facial form data. The superior protection of the halo-butyl elastomer facepiece has been proven with live agent testing; it is impermeable to chemical agents such as sarin and sulphur mustard > 48hrs. Available in two sizes for optimum fit and safety. The respirator is easy and rapid don and doff - within 9 seconds. Scott's extensive range of CBRN filters provides protection against all known chemical, biological, radiological and nuclear agents and hazardous particles, like microorganisms. The M 95 respirator is comfortable to wear, even over long periods, thanks to its extremely low breathing resistance. Light in weight: the mask weighs only 460 g - or 720 g with the filter. The special small-size silicone inner mask reduces the CO2 content to a minimum (< 0.45%). Moisture drainage is effective due to the practical downward positioning of the exhalation channel. Protected speech-diaphragm for optimal communication. Polyester webbing band harness enhances wearer comfort and rapid donning. Integral drinking tube for the hygienic and convenient intake of hydration, double-threaded connector is compatible with a special M 95 bottle or a PET bottle. Filter connections on both sides of the facepiece facilitate leftor right-handed operation. Six-point head-harness ensures correct fit of the facepiece. Spectacle frames for prescription lenses are easily secured to the anchor point in the inner mask and remain stable in hostile environments. Circulating the inhalation airflow across the inside of the lenses effectively prevents fogging. The dual lenses combined with the close-fitting profile of the mask offer an excellent downward and horizontal field of vision - > 80%. The two-lens construction means that the mask can be folded in half longitudinally for compact stowage in a mask pouch.